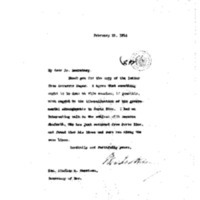 Woodrow Wilson thanks Lindley Garrison for sending him word about Puerto Rico. Thank you for the copy of the letter from Governor Yager. I agree that something ought to be done at this session, if possible, with regard to the liberalization of the governmental arrangements in Porto Rico. I had an interesting talk on the subject with Senator Shafroth, who has just returned from Porto Rico, and found that his ideas and ours ran along the same lines. Wilson, Woodrow, 1856-1924, “Woodrow Wilson to Lindley Miller Garrison,” 1914 February 8, WWP18358, First Year Wilson Papers, Woodrow Wilson Presidential Library & Museum, Staunton, Virginia.